Congratulations to our September 2018 Partner Spotlight of the Month: Dahlia Campus for Health & Well-Being! Located in Denver at the corner of 35th and Dahlia in Northeast Park Hill sits the Mental Health Center of Denver’s Dahlia Campus for Health & Well-Being. 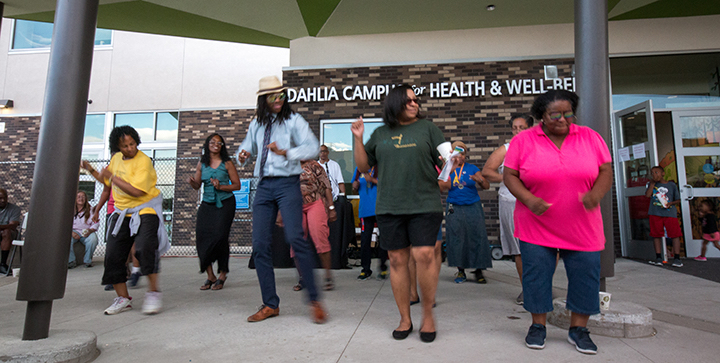 The Dahlia Campus is an important neighborhood asset, providing an array of holistic services geared towards enhancing one’s mind, body and community. The site is accustomed to serving a bustling population, as it was once home to Dahlia Square Shopping Center – the largest African-American owned shopping center in the United States at the time. The center thrived for many years in the 1960’s, 70’s and 80’s but fell into disrepair and was eventually shut down over 20 years ago. While the site sat vacant for many years, organizations slowly made their way to the area. The first was Denver Health’s new Park Hill Family health clinic at the corner of 33rd and Elm in 2009, followed by the Dahlia Square Senior Apartments (affordable rental units) which were built in 2011 & 2012. The most recent addition to the site was the Mental Health Center of Denver’s new facility, which opened in January of 2016. The Mental Health Center of Denver’s mission reads: Enriching lives and minds by focusing on strengths and well-being. Their mission is founded on the philosophy that people can, and do, recover from mental illness and that treatment works. In line with this mission, Dahlia Campus aims to provide an open space where community members can connect with others, learn new skills and find the help they need. While the campus is an incredible example of the power of community impact and partnership, the path to present day was not always easy. Darcie Ezell, Community Engagement Coordinator at Dahlia Campus, explained that Northeast Park Hill residents were made many empty promises for future community development in the past. That, coupled with fear that a mental health center could increase crime, created a challenging start for Dahlia Campus. While the Mental Health Center of Denver saw a need to provide clinical services in the neighborhood, they realized the residents understood best how to improve their health and well-being. In 2012, they launched a two-year process to engage community members and better understand their wants and needs. The grass roots effort started through discussions with Gerie Grimes of the Hope Center and Ana Jo Haynes, resident and founder of Mile High Early Learning – both long-time leaders in the neighborhood. Dr. Lydia Prado, former Vice President of Child and Family Services at the Mental Health Center of Denver, led the community-informed approach, which aimed to include and engage every resident from the 80207 zip code (primarily encompassing NE Park Hill). During the process, staff worked with civic leaders, schools, stakeholders and local residents to design a campus that would truly serve the community. Tucked away in Ezell’s office was one of the original questionnaires distributed during the engagement process. Questions included best hours of operation, what vegetables and flowers should be planted in the gardens and additional services that could addresses community needs. As momentum gained within the neighborhood, the Mental Health Center of Denver broke ground on the campus at the end of 2014. Ezell explained that once construction started and residents saw this was not another empty promise, community buy-in slowly trickled in. “The incredible community support and collaboration behind this development is the real story of Dahlia Campus,” Ezell explained. One of Dr. Prado’s main stipulations during construction was that the foreman kept office hours to answer any questions from local residents. Taylor Kohrs was selected to be the general contractor, and Ezell confirmed they were very successful in not only the construction of the Center, but were committed to working with and engaging with local residents and stakeholders throughout the project. 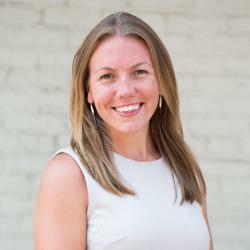 The Center also required Taylor Kohrs to hire within the community, which encouraged trust throughout the neighborhood and provided additional opportunities for community engagement and outreach. Nearly three years into Dahlia Campus’ existence, the campus is thriving and continues to expand an already impressive list of services for the community. Following the two-year engagement process, four main community needs were determined: access to fresh foods, youth dentistry, early childhood education and community gathering space. The Dahlia Campus has met these needs and more. In 2017, more than 2,200 pounds of greens were grown and sold at the campus, with 1,200 catfish and tilapia living in the aquaponic greenhouse. Dahlia Campus also provides children and family focused clinical services, a children’s dentistry, and early childhood development in addition to the farms and gardens. The campus is home to multiple gathering rooms, a full-service teaching and cooking kitchen, outdoor playground, a gym and a plethora of indoor and outdoor event space available to residents and organizations in Northeast Park Hill. In response to community needs, Dahlia Campus also expanded their operating hours to stay open until 7 pm on Tuesdays and Thursdays, with security staff on site until 10 pm, allowing the Center to be available for late night meetings and events. Ezell explained the importance of the extra hours, as the community frequently utilizes the space whenever available. Just last week, after hours events (in one single night) included a food pantry, community meeting and parent’s night. The Mental Health Center of Denver truly created a neighborhood asset with Dahlia Campus for Health & Well-Being. As an active organization also dedicated to serving the resident of NE Park Hill, ULC has been supportive and have admired how well the Campus has truly brought this passionate community together. ULC made our first acquisition in the NE Park Hill neighborhood in 2009, redeveloping the burned down Holly Shopping Center to be a children’s campus that is now home to Roots Elementary, the Vickers Boys & Girls Club and outdoor community space. ULC also purchased the Dahlia Apartments out of foreclosure in 2010 – 36 units of permanently affordable 2 bedroom apartments adjacent to the Dahlia Campus for Health & Well-Being. Despite what may seem like the seamless implementation of programming and services – Ezell explained it has been quite the learning curve. Dahlia Campus has consistently entered unchartered territory to meet community needs regardless of the additional work it has required to provide certain services. To learn more about the Mental Health Center of Denver, you can visit their website here. To specifically learn more about Dahlia Campus, click the link here!